As automakers aim to keep sales ahead of 2015's record-setting pace, they're pulling out all the stops to draw in buyers. Virtual reality may be next in their bag of tricks. 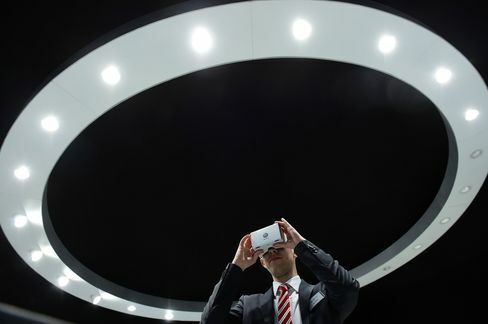 Volkswagen AG's Audi plans to roll out Oculus Rift headsets in a number of dealerships by the end of this year. Johan de Nysschen, president of General Motors Co.'s Cadillac, in February encouraged some of the company's lowest-volume outlets to go virtual. With dealers from Brazil to Berlin already experimenting with virtual reality, automakers see twin benefits of the technology: enhance the customer experience while also shaving off some of the $2.75 billion U.S. dealers spend annually on interest to keep new vehicles on their lots. "You're wearing the glasses and you really think you're in the car," said Marcus Kuehne, Audi's virtual-reality project lead. The brand already allows customers to pre-equip cars in a handful of highly digitized urban dealerships and sees virtual reality as the next step in letting shoppers see what they want to buy. "You get a good feeling for the size -- do the rims fit to the body of the car, do the colors inside the car fit well together?" he said. "You can judge this much better through this technology than on a screen." Letting customers manipulate models, color schemes and features in a virtual environment is automakers' latest tool to distinguish themselves in a slower-growing yet very profitable market. April sales announced on Tuesday will probably show gains for most of the biggest U.S. and Japanese automakers, as the annualized selling rate, adjusted for seasonal trends, rises to 17.5 million, according to a Bloomberg survey. The pace and the month's total are projected to set April records. "Top-line performance of the industry remains robust -- retail demand is strong, transaction prices are at record levels and consumers will spend more on new vehicles than in any other April on record," John Humphrey, senior vice president of the global automotive practice at J.D. Power, said in a statement. "The slowing rate of growth, shift in consumer demand away from cars and toward SUVs, and elevated fleet volumes pose significant challenges to manufacturers as they compete in the marketplace." General Motors expects industrywide sales to rise 5 percent and a seasonally adjusted annualized pace of 17.5 million vehicles or higher, said Kurt McNeil, vice president of U.S. sales. While the Ford and others have increased sales to fleet customers so far this year, GM has reduced them. As a result, the Detroit-based automaker delivered record North American profits in the first quarter, even as U.S. sales slipped by a few hundred. For April, analysts project a 1.7 percent decline for GM. "The economic fundamentals are there," McNeil said. "Interest rates are still low and gasoline prices may be the lowest this summer since 2005." Nissan Motor Co.'s sales may rise 11 percent, the biggest increase projected by the analyst estimates, followed closely by Honda Motor Co., seen gaining 10 percent. Combined sales of Volkswagen's VW and Audi brands may fall 1.5 percent as Europe's largest automaker tries to overcome consumer distrust since its diesel-emissions cheating scandal that may cost about $18.2 bilion. Automakers already have some experience using virtual reality to promote their vehicles. In 2014, Fiat Chrysler Automobiles NV touted the 2015 Chrysler 200 sedan by giving viewers a virtual reality tour of its factory. Volvo Car Group, owned by Zhejiang Geely Holding Group Co., used the technology to introduce its XC90 SUV to consumers before it became available in U.S. dealerships less than a year ago. And at this spring's New York auto show, Toyota Motor Corp. enticed visitors by letting them use headsets that demonstrated its cars' safety features, including pedestrian detection. Virtual reality has blossomed from a far-out concept to an almost-practical form of delivering entertainment and information thanks to improvements in image quality, computer bandwidth, and investment by companies like Facebook Inc. Oculus VR Inc., which was bought by Facebook for $2 billion in 2014, launched its virtual reality headset for $599, compared with HTC Corp.'s HTC Vive, priced at $799. While the gaming industry will likely account for most of virtual reality's near-term use, Bloomberg Intelligence analyst Jitendra Waral sees it becoming a core part of the consumer experience for a number of industries, including autos, health care and tourism in the next four to five years. Sales tied to the headsets may top $1 billion this year and reach $21 billion by 2020, Waral estimates. "What companies are doing is they're creating these consumer touch points to differentiate themselves and be more competitive in terms of the experience," he said in a phone interview. "It's completely different than the way you do things right now, so that novelty is what grabs the attention."